The CWI exam is a thorough and challenging exam. For many welders, becoming a Certified Welding Inspector (CWI) through the American Welding Society is a professional aspiration. Attaining a CWI credential can be the next step in a successful welding career, and attests to the skills and abilities of an individual in the areas of welding processes, procedures, qualifications, and testing. As you can imagine, many enthusiastic welders often look to take the exam as soon as they meet the minimum work experience requirements, and often reach out to us for some tips. In fact, of the many inquiries that we receive at AWS Learning, how to prepare for the CWI exam is among the most common. And while professional enthusiasm is certainly an important element of becoming a successful welding inspector, it is important that the following bit of information is fully understood before we begin. The CWI exam is a thorough and challenging exam. It is one that can prove to be a demanding undertaking for even the most seasoned professionals and experienced test-takers. Establishing this fact early on is necessary for a few reasons. Firstly, it’s important to be aware of the difficulty of the exam in order to properly prepare for it. Just like any issue you may encounter on the job site, it’s crucial to accurately gauge its scope and complexity in order to determine the best approach and dedicate adequate time and resources for its solution. Secondly, it’s important to know that the CWI exam is challenging because it needs to be. CWIs make assessments and decisions that can affect countless lives. Therefore, they must possess a wide range of skills, knowledge, and abilities in order to be effective and make responsible judgements. Because of this, the exam covers a wide range of technical topics, processes, and principles. Now that we’ve got an idea about how challenging the test can be, let’s begin by taking a look at the exam itself. The CWI exam is split into three parts: a fundamentals portion, a practical application portion, and a code application portion. These sections are labeled Part A, B, and C, respectively, and you are given two hours to complete each of these sections. Each section is scored separately, and a score of 72% or higher is required for each section in order to pass the exam and earn a CWI credential. Failing the exam doesn’t always mean you have to take the whole thing again. If you finish with a cumulative score of 72% or higher, but failed to reach 72% on any one particular section, you only need to retake that particular section of the test again in order to pass. Maximizing the amount of correct answers you get in one particular section can boost your cumulative score to 72% or higher, and prove to be the difference in determining how many parts you’ll have to re-take, if it comes to that. However, if we’re being honest, no one wants to take the exam, as a whole or in part, more than once. So let’s briefly go over each section and a few things that can give you a leg up in terms of preparation. Part A of the exam covers welding fundamentals. This part has a minimum of 150 questions and a time limit of 120 minutes. Theoretically, that means you have less than a minute you can dedicate to each question. You should do your best to quickly answer each question, skipping any that you may be unsure of, and returning to them if time allows. Keep in mind that as far as grading goes, an unanswered question counts as an incorrect answer. As such, it’s best to answer every question on the CWI exam, even if it’s an educated guess. Part B is the practical application, or hands-on, portion of the CWI exam. It’s a 120-minute test that covers a range of topics in the areas of welding examination, procedure and welding qualifications, nondestructive testing, and visual inspection. This part of the exam has a minimum of 46 questions, which is considerably less than 150, but don’t let your guard down. For Part B, you’ll be provided with a sample book of specifications, plastic replicas of welds, and visual inspection tools, including dial calipers, micrometers, rulers, V-WAC and fillet weld gauges, and flashlights. What Am I Expected To Know? 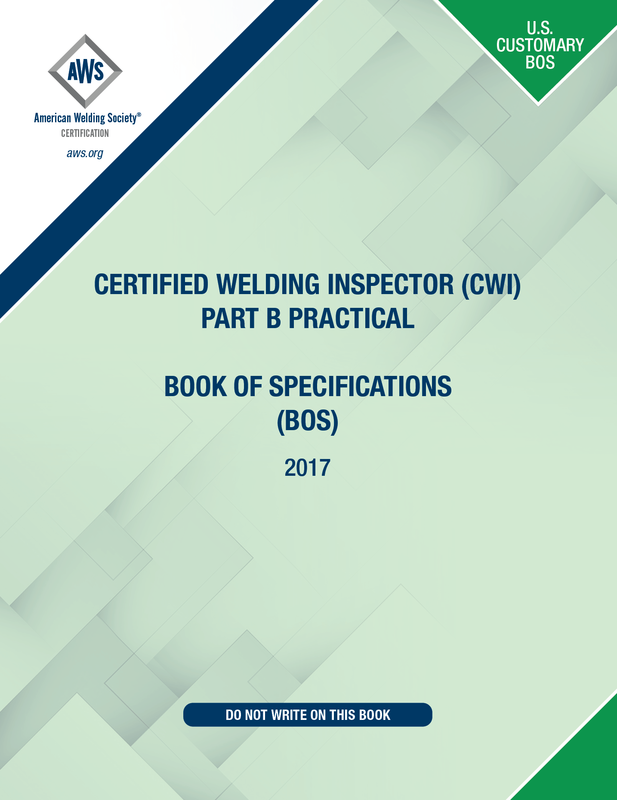 The CWI exam is created by industry experts, and documented in two standards: AWS B5.1 Specification for the Qualification of Welding Inspectors and AWS QC1 Standard for AWS Certification of Welding Inspectors. To truly get a solid understanding of what you’ll need to know in order to tackle the CWI exam, you must thoroughly familiarize yourself with these two documents. Get them. Read them. Know them. Taking the exam without reviewing these documents is like playing a game without knowing the rules. 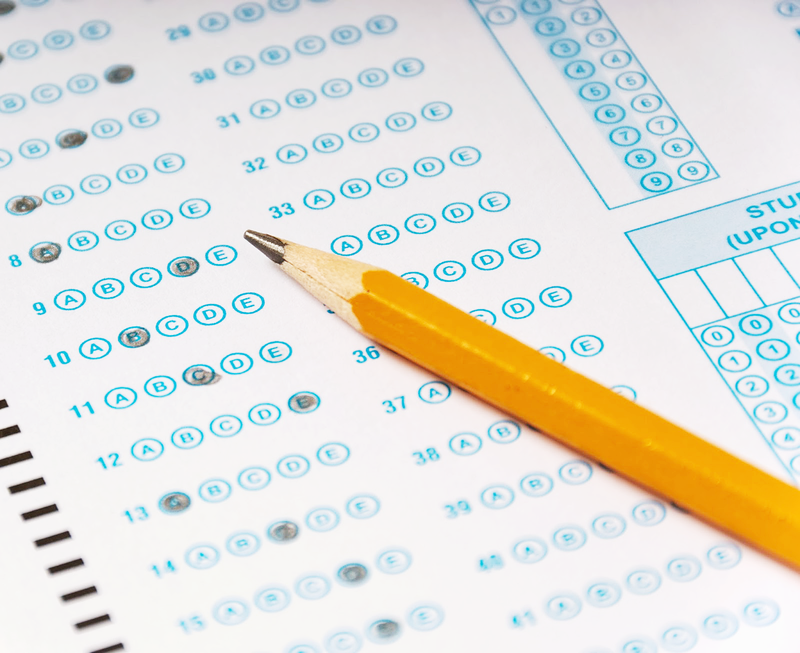 Section 5 of the B5.1 document details the basic requirements to take the exam. Table 1 lists the capabilities required of a CWI in the areas of procedure qualification, standards, knowledge and skills, performance qualification, inspection, safety, and more. Section 7 of the standard reveals the basic structure of the exam. It shows which topics are covered in parts A, B, and C of the exam, and what percentage of questions will focus on each topic. For example, in Part C (Code Application) approximately 10% of the questions deal with Material and Design, 30% deal with Fabrication, 25% deal with Inspection, and 10% deal with Qualification. These percentage figures do not add up to 100% because each one represents a minimum, and any one of these topics can potentially be featured a bit more prominently than what is specified in the standard. Annex A of the B5.1 standard provides another piece of useful information. The preamble says that the information contained therein is not officially part of the specification, and is simply there for informational purposes, but that doesn’t mean you should ignore it. Quite the opposite! Annex A provides a list of reference materials that may have been used in the creation of exam questions. The list includes various specifications, guides, and handbooks published by AWS, ISO, ASNT, and ANSI. It is by no means an all-inclusive list, but it can certainly give you a better idea of what materials you can utilize to prepare for the exam. All this information, including additional recommendations for self-study, can also be found in the CWI Body of Knowledge document. The QC1 standard addresses how personnel are certified, and the principles of conduct and practice by which certification may be maintained. Section 2 defines the three levels of CWI certification: Senior Certified Welding Inspector (SCWI), Certified Welding Inspector (CWI), and Certified Associate Welding Inspector (CAWI). Section 4 specifies the duties that each of these levels can perform. Section 11 details the professional and ethical responsibilities of a CWI. Some sections – like 5, 6, 8, and 10 – summarize exam requirements, and refer the reader to the B5.1 Standard. Sections 12 through 16 deal with the maintenance, renewal, and revocation of the CWI certification. Check back soon for Part 2 on this topic, which will cover ways to help you assess and bridge the gap between how much you know and what you need to know, as well as give you information on the CWI Pre-Seminar, seminars, and methods of self-study. Leave a comment below if there is something you think we missed, you’d like us to cover, or if you have any questions. please am a welder but nigerian pls how can i register foe this CWI Ihave interest any amount am ready to pay,kindly gave assistance how to go about it. 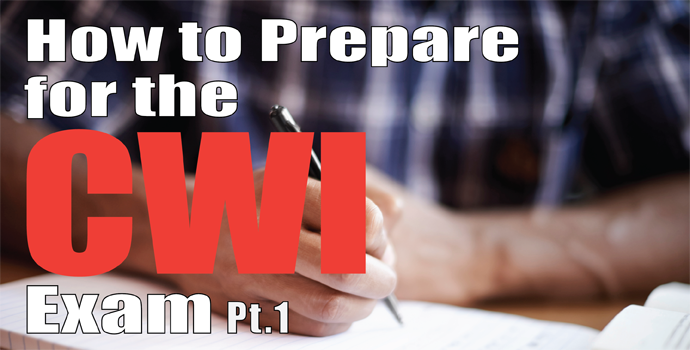 …And stay tuned for more blog posts about how to prepare for the CWI exam. Me parece muy interesante e Importante para todos aquellos que quieren y les gusta la Soldadura ! Como puedo hacer para poder realizar esta preparatoria y posterior el de inspector. Espero sus respuesta favorable . I am slated to take the CWI Seminar as a Section Representative in April. And I am taking the test on Saturday following the seminar. I have been wondering besides the seminar, what other things should I be studying or reviewing to be more prepared? The online program is designed to prepare you for Part A/Fundamentals part of the CWI exam. I am interested in obtaining information regarding to nine year CWI renewal by endors ments. Does AWS offer API 1104 self study programs?? What and where are the seminars offer, if I choose to attend. I will be preparing to retake my test after failing back in Oct. 2015, should get any new study material beside the ones i got from the seminars last year? Should i study D1.1-2015 or will 2010 knowledge i have work? Any other pointer will be very much appreciated, Thank you very much in Advance! My brother is a welder, ans I think that getting this certification would be a good career step for him. Do most takers use up the entire two hours allotted for each section? This sounds like a very intense exam! How long is the certification good for? Thanks for this information! Estoy interesado en llevar el curso para ser inspector. La parte Baja del examen Lo resuelvo empleando el Libro de Evaluación de Especificaciones (Examination Book of Specifications), actualizado en Diciembre del 2008. O puedo elegir la segunda versión, empleando el Libro de Especificaciones (Book of Specifications), publicado el 01 de Enero del 2016. O puede resolver ambas versiones, Usted decide. Cuál le corresponde a Perú? After more than 40 years of welding without ever being Certified, I now find myself want ting to receive a CWI. My question is can the online prep course be used in lieu of the walking seminar to prepare one for the test. And if so, can one go back and forth on the prep course as needed within the 90-day window of use.